The Dryft Net: Why client-side verification is bad..
Why client-side verification is bad.. 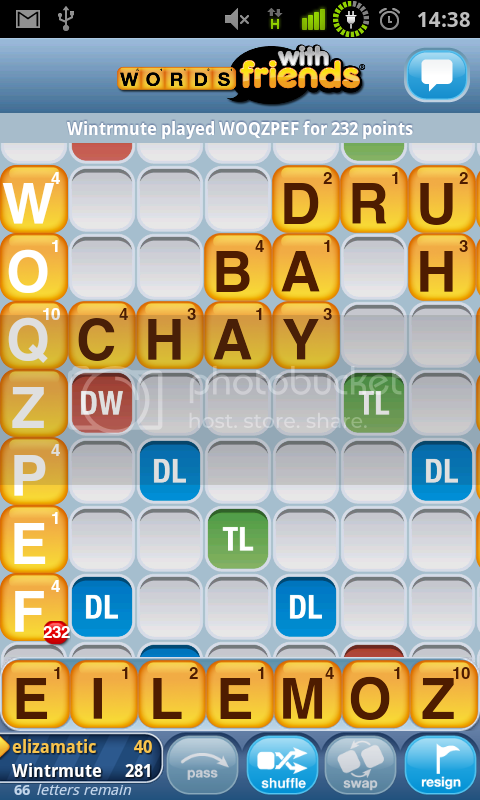 I recently looked into Zynga's "Words with friends" mobile application, and to my surprise discovered that it did client-side verification of the words you are playing. It wasn't very hard to circumvent this, resulting in a version which accepts moves like the above one.. I agree with you.. It's not wrong to use client-side methods to do initial validation, but it's wrong to *trust* that validation on the server side. I probably wasn't very clear on my feelings though. Client-side validation should be seen as a presentation issue. It can allow a user to see the errors a server is going to return, before they've even submitted the page. It is quite bad in practice as many people forget to test for the case that it isn't working, or is deliberately avoided. A truly stunning example was on HackerNews a while ago: http://www.cadw.wales.gov.uk/ (view the source to see it). Just imagining the look of WTF to have washed over elizamatic's face is, in itself, satisfying.